This week we meet Ginza Fahimi, who is scanning cultural heritage masterpieces of the National Museum of Iran. My name is Ginza Fahimi, I´m an Iranian softwareengineer and an archaeology master graduate from Universidad Complutence de Madrid. During my collaboration with the Royal Academy of Fine Art of San Fernando here in Madrid, I got familiar with Agisoft PhotoScan which was used on a project to produce 3D virtualization models of various objects in the museum of the Academy. I was interested to do the same work on some artifacts in the National Museum of my country Iran, in particular Iran Bastan Museum, in order to share and present our cultural heritage. The archaeological museum of Iran is isolated and practically unknown to the rest of the world. There are so many valuable archaeological pieces and artefacts that have never been exhibited to public and are kept in the museum storage. 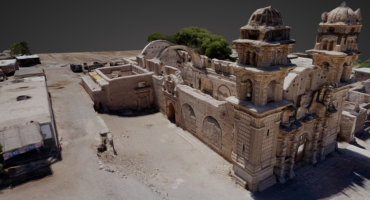 Nowadays museums such as the British Museum, the Metropolitan Museum of Art, etc, have initiated programs aiming to digitalize their collections in 3D on the bases of “the more you see, the more you learn”. The users not only can view the 3D rendering, but even download them for educational purposes. These models are available to the public to be visually examined in a way that was never possible before. I tried through many different ways to obtain permission to photograph some artifacts of the Iran Bastan Museum with no success. Therefore, at the short trip that I had to Tehran in October 2015, I decided to go in as a normal visitor and despite of little time and lack of means, I photographed some items with the intention of producing 3D models. I took the photographs under precautious situation, with limited access only to the front of the artifacts, using a simple compact camera – Sony DSC-H50 – with a very low resolution. Following that these photos were processed with a normal laptop. These models are now uploaded in an unofficial account that I created for National Museum of Iran in Sketchfab. Here I bring you one of those models, the Central Relief of the northern stairs of Apadana. It’s one of the highlights of the Archaeological museum in Tehran. The construction of Apadana or Audience Hall begun by Darius I The Great (522-486) and finished by Xerxes. This palace was used mainly for grand receptions by kings. Thirteen of its seventy-two columns still stand on the enormous platform of which two monumental stairways, on north and on east sides, provide access to the palace. They are adorned with rows of beautifully executed reliefs showing scenes from New Year’s festival and processions of representatives of twenty-three subject nations of the Achaemenid Empire, including Persians and Medes, followed by soldiers and guards, their horses, and royal chariots. At some point in Antiquity, this relief was removed and set up in the Treasury. The archaeologists that excavated Persepolis also found a similar relief, which once was part of the eastern stairs. It is not known why these reliefs were removed. The relief shows king Darius on his throne, crown prince Xerxes behind him, two incense burners, and an important official, probably Pharnaces, in front of him. Pharnaces salutes the king, and announces the arrival of the tribute carriers. Offering of gifts was one of the central elements in the Persian royal ideology, and Apadana was, therefore, one of the most important symbols of the great king’s power. It is no coincidence that Alexander The Great, in 330, chose to destroy Apadana and the Treasury (where the presents were stored), together with the Palace of Xerxes. Whatever the fact, we shall call the man on the throne Darius and everything suggests the great kings majesty. For example, he has a lotus flower in his hand which symbolizes eternity. The king’s feet don’t touch the ground. This was an important attribute. The king is the only one who is sitting; he is also larger than the others. His shoes are finer than those of his courtiers. To see more of Ginza’s models here on Sketchfab, check out her profile. Is there a way to contact or message Ginza directly?